short girl, long island. : Interview: Christina "Bean" Fiorino. Bean, wearing one of her cookie hair clips. I come from a family full of artists- all different kinds. I was lucky enough to be born with the same gift. My imagination runs wild and it’s hard for me to stay focused on one type of art when there is so many to choose from. I’m a hands-on kind of girl and I don’t mind making a mess (although, I hate cleaning it up). I was born and raised on Long Island. There’s tons of competition here, but I learned that you can’t get discouraged by it and only learn and grow and become a better artist. I’ve been told that in the art world “everything has been done” and that as an artist it’s our job to turn it into something special. I sort of disagree with this…there are plenty of things that haven’t been done yet…we just aren’t using our imaginations to their fullest potential. As artists, it’s our jobs to show the world something they haven’t seen yet and inspire future artists. When did you decide to pursue photography professionally? It’s never really been a “profession” to me, really. I started my own business a few years ago, but it’s such a cut-throat industry that eventually I just found it more fulfilling to just photograph for myself. There’s just so much you can do with photography if you’re not afraid of criticism and rejection. However, if you start out shooting for yourself, you won’t be afraid to stray away from your comfort zone. What was the first art medium you worked with? Probably something made by Crayola. Does that count? How did you come up with the names for your Etsy stores? For my vintage shop, History, I was looking for a way to incorporate “vintage” without being too literal. RABBITteeeth I recently confessed to my boyfriend that he was the inspiration behind the name. Basically, he looks like a rabbit when he sleeps and I just liked the way it sounded. I added the extra ‘e’ for no special reason. Finally, I have SugarClips opening soon, which is my hair accessory shop. I just thought it sounded cute. 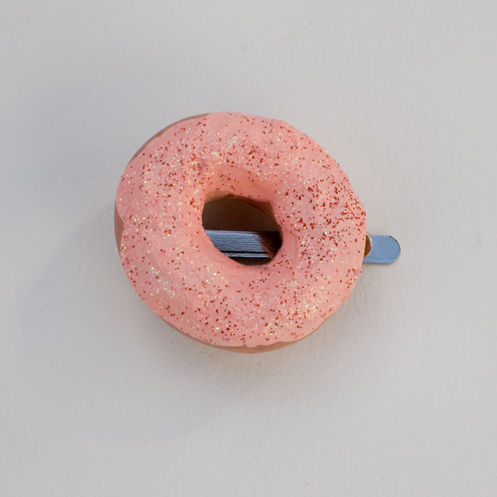 Strawberry Glazed Donut, $10 at SugarClips. When did you start making hair accessories? Sometime between 2006-2008. I honestly don’t remember exactly when, but it was my very first Etsy shop. I sold feathered headbands. I turned it into a print shop, but eventually closed it due to being too busy with school and work. A good song, childhood memories, nature, Disney World and Tim Burton. Out of all of your art endeavors, which is your favorite? I guess photography would have to be my favorite since I’ve been working on my skills since I was 15. Again I’m going to have to go with Disney and Tim Burton. There are just so many elements to both. Disney is extremely whimsical and Burton has a mix of both whimsy and creepy, which sums up a lot of my work. 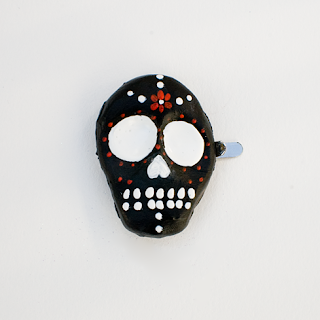 Sugar Skull, $10 at SugarClips. Do you plan ahead when you’re designing, or are most of your designs sponataneous? A little bit of both. For my hair pieces, I could be out shopping and have something pop into my head and I’ll spend hours planning it or I will be sitting at my desk kneading clay for however long until something strikes. When it comes to my photographs, 99% of the time it’s planned ahead. Do you prefer listening to music when working on your pieces? If so, what? I do prefer it, but more often than not I’ll find myself working in silence. 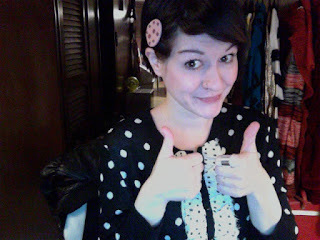 Most likely getting the hair accessory shop up and running. What is your favorite piece(s) that you have in your store(s) right now? My favorite vintage piece is a piece I just sold. It’s Betsey Johnson dress from her 1980’s “Punk Label” collection. It was one of those Little Black Dresses with a Betsey twist. 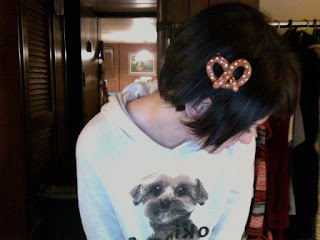 Bean, wearing the Soft Pretzel clip. You can check out Bean's photography at Christina Fiorino Photography and her Etsy stores can be found here: History, SugarClips, and RABBITteeeth.